I would like to specially welcome you to this new year 2018. Thank you for being a part of Myss Lafunky's Blog in 2017 and we hope that you'll keep reading, interacting and following through this new year. A new year means different things to various people and for us at Myss Lafunky's Blog, the new year marks the beginning of new things; new inspirational posts, new life-transforming discussions, new expedition into the scriptures etc. In this year, we would like to "forget" the achievements of the past and launch out into the deep of the uncharted wilderness because God is set to do new things in this new year. I don't literally mean forgetting those achievements and acting as though they didn't happen, No! I actually mean being thankful for those achievements but not being complacent with them but striving for a greater and deeper level in all we do. I am also confident that God has already gone ahead into the new year to put a road into that wilderness so that we have a path to follow. So, I would like to encourage you to join us in this new year as we "forget" the successes and achievements of the past like Apostle Paul and press towards the mark of the higher calling of God in Jesus. 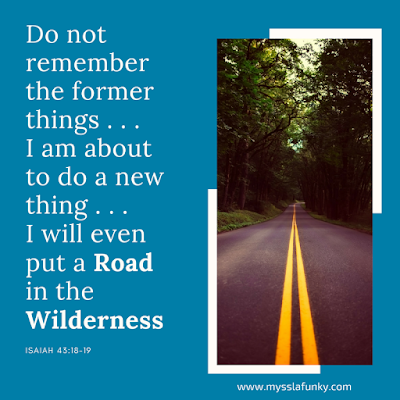 For you, this may be regarding your career, business, ministry etc., just make that decision to "forget" the past and move forward to the new thing God has for you. Have a wonderful year 2018.